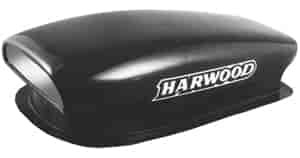 Harwood's line of Aero Scoops has something for everyone. Each scoop is hand finished then covered with an ultra-smooth gel coat so prep time for painting is minimal. Remember, 1" air bypass holes should be drilled in the rear of the air pan to allow air to flow through the scoop to prevent air pressure build-up that could damage the scoop when the carb is closed at engine shutdown or deceleration. The unique rear section of the free-standing scoop is designed to allow windshield wiper clearance or use of a separate (from body) cowl panel. A smaller version of the popular Aero Series. Designed to meet the 5" hood scoop requirements for Super Stock and Comp Eliminator classes. The windshield-length Aero scoops are designed to be mounted against the windshield for improved aerodynamics and are necessary for cars with substantial engine set-back. The open rear section has an angle to suit most applications. All new design features reduced air inlet and narrow design for improved aerodynamics. Provides maximum airflow with low wind resistance for unmatched performance.